At Mack Orthodontics, we're proud to provide high quality orthodontic care to our patients in our fun and friendly Bettendorf, Maquoketa, and Eldridge offices. Dr. Mack and his highly trained team of orthodontic specialists work hard to treat all our patients on an individual basis, designing specialized treatment plans that perfectly suit each patient's unique orthodontic needs. But, while you may think we're talking exclusively about braces, think again! There's a new type of treatment gaining popularity amongst adults and teens: Invisalign. When you hear the word "orthodontics," we're betting you think of traditional metal braces. But, while braces remain our most popular treatment, they're far from the only orthodontic game in town. Invisalign is a revolutionary treatment alternative to braces that does away with metal brackets and wires, utilizing a series of clear, removable trays called aligners instead. These aligners are virtually invisible when worn and can be popped in and out to eat, drink, brush your teeth, and floss, which means that they come with a number of advantages. No more fussing with floss threaders! Because you can take your Invisalign aligners out to brush and floss, cleaning your teeth is easy as ever. The aligners are transparent and fit directly onto your teeth, so almost no one will know you're undergoing orthodontic treatment! Wearing braces means you have to avoid foods that are hard, sticky, or crunchy. But with Invisalign you take your aligners out to eat, so you can still enjoy all your favorite foods and tasty treats. While metal braces can sometimes poke and prod the soft tissue of your gums, Invisalign aligners are smooth and won't irritate your mouth. For patients with bruxism (chronic grinding and clenching of the teeth), Invisalign can add a layer of protection between your teeth as you sleep. While Invisalign used to be reserved for a few mild orthodontic conditions, advancements in technology have made it possible to treat a wide variety of common orthodontic problems using Invisalign. Invisalign treatment is simple. First, you'll come into our Bettendorf, Maquoketa, or Eldridge office for an initial evaluation with our orthodontist where you’ll have detailed measurements and photos of your teeth taken. Your orthodontist will use that information to construct a treatment plan that gets you to your dream smile in the most efficient way possible. From there, your plan will be divvied up into a series of stages and Invisalign aligners will be custom-manufactured to fit your teeth for each of them. You'll wear each set of aligners 20 -- 22 hours a day, only removing them only to eat, drink, brush your teeth, and floss. Every two weeks you’ll switch to a new set of aligners. With every pair you go through your teeth will move closer to their optimal alignment. While the discretion and convenience of Invisalign have made it a hugely popular form of adult orthodontic treatment, we also offer specialized Invisalign treatment just for teenagers. 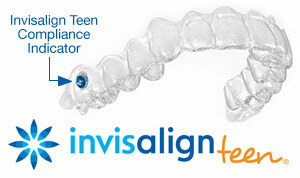 This unique treatment (known as Invisalign Teen) comes with a number of features that make it perfect for the teen lifestyle. Special eruption tabs hold open space for molars that have yet to erupt in your teen’s mouth, helping to preserve the natural smile. These indicators tell doctors, parents, and teens if the aligners are being worn long enough, or if they need to be worn more diligently. Each Invisalign Teen plan comes with six replacement aligners completely free of charge, so there's no need to worry if one gets lost or broken. Without proper cleaning, food can get stuck under your Invisalign aligners. This may lead to tooth decay and cavities that can derail treatment and lead to costly repairs. To avoid this type of damage, it's critical that you brush your teeth at least four times a day—after breakfast, after lunch, after dinner, and before going to bed. Additionally, when you brush your teeth, be sure to also brush and clean your aligners before you put them back on. When you're finished with treatment, we know you'll be excited. But, just as with braces, it's critical to wear a retainer. As an Invisalign patient, you can simply use your last aligner as a retainer. When you finish treatment we'll give you detailed instructions for caring for your teeth during this retention period. Have more questions about Invisalign, or want to find out if it's the right teeth-straightening option for you? Feel free to call us at 563-359-4686 to reach our Bettendorf, Maquoketa, or Eldridge, IA office. You can also reach out to us at our contact page, or use our easy online form to schedule your next appointment with our orthodontist. We can't wait to hear from you, and we look forward to helping you or your teen achieve a beautiful and healthy, lifelong smile!